The most common use of fine motor muscles today may be learning to use a keyboard which is a wonderful skill to have but has the touchscreen surpassed that, or voice commands? We urge you to not forget to work on the development of finger and hand muscles in your wee ones. There is a fine motor progression we will follow to give you a better idea of how to work your way into this. In all of these activities, it is important for the adult to participate with the child in the activity before letting them do it on their own while the adult is involved in something else nearby. At around the age of six months or as soon as they can sit up, sit them next to the drawer where the plasticware is kept and let them take everything out and put it back in again. This will speed up the myelination (development of their nerves) of their arms, hands, fingers. They will be wobbly at first but progress to becoming on target. 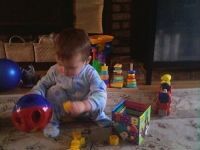 The next step could be to introduce a shape sorter toy. Language development tip: As the infant/toddler is putting objects in and out of the container, be sure to say aloud "in" and "out" as they do this. Follow this up with: "You put the lid in the drawer", etc. After this, give your child any safe items that can fit inside a smaller container such as a bowl to place these items in and take them out. The next step would be to take a can (large size like a coffe can) without a lid on it and repeat the game of putting items in and taking them out. Once this is familiar, get the trusty can back out and add a challenge by putting the lid on it. Make a small hole in the lid through which they will be able to place wooden clothespins (without metal) into the can. You could also make a slit in the lid for tops of cans (without sharp edges!) to slide into like coins into a slot. Start with easy tasks and progress to more difficult ones. After the child has learned to put things into the can, take the lid off for them to take the thngs out. Developmental milestone: Children have little understanding of size discrimination at these stages. This is why we are taking the lid off of the can for them before they put their hand in and get it stuck. There is a progression of large to small receiving containers and wide openings to more exact shaped openings. In fact, the final stage could be to make holes the size of pencils or crayons in the lid of the can and have the child slide these into the can. This could also work with the old clementine boxes that come with the holes already made in the wood which are slightly larger than a pencil's width but not too big. Being able to hold a longer item like a pencil and fit it through a smaller hole will get a child closer to the skills needed for writing! The smaller to larger principle applies to beads as well. For toddlers, large beads with large holes are best. These can be made at home by cutting slices down swim noodles in about 1/2 inch thick chunks to be easily gripped by small hands. (Of course, you want to use the swim noodles that come with the holes through the center.) In order to make this a stringing game, use an old shoelace or some string/colored yarn with masking tape on one end to make it stiff (this should be about 1 1/2 inches long) so that the little hands can lace with it easily. Sidenote: This is a fine motor progression but beads are also excellent for using in games to develop the cognitive skills for pre-math and pre-reading - games that work on sequencing, patterns, colors, etc. After the child finds it easy to work with the large beads, move to smaller beads such as wooden beads. When they're no longer at risk for choking, put pony beads on a pipe cleaner. This can be used to make jewelry for friends or other crafting adventures. All types of art are excellent for developing fine motor skills. Sometimes parents are afraid things will get too messy so here's a tip: start by having one place for art such as a child's table. Then put a shower curtain on the floor underneath that table. Crayons on a blank page is a good place to start. Scribbling is practice for muscles, not a waste of paper. If they do write on the walls during this new phase of realizing art, make a game out of running for the art space (from each room in the house) and be sure to join them in this task. This will solidify the one place we are all meant to use our colors. There have been waves of coloring book excitement, then free drawing only, then back to coloring books being acceptable again. Kirby believes that coloring in a real picture can be very good for developing fine motor skills. The recommendation is to start with lots of scribbles on scrap paper until they can start to color inside some parameters. At this point, make a large shape for the child to color inside, then make another one a little smaller than the last, and so on. After this, it would be appropriate to try out a simple coloring book. Remember, enjoy coloring with them! After some control with crayons and markers has been established, introduce painting during the summertime so a bathing suit or some old clothes can be worn in the process (and you can hose them down at the end to transition into some water play). Buy paintbrushes that have colored handles to match the colors with which they are being used. Attach some paper to a piece of cardboard that can be nailed to a tree or pegged to the ground. The paint can be placed in small plastic containers that have a top with a hole in it large enough for a paintbrush to go through. Once they have better control, move inside for painting in the art space. Start with one primary color (red/blue/yellow) then bring more colors into the mix on a tray together so that the child can make new colors with these primary colors. Don't forget to teach them to rinse their brush between each color when they progress to the multicolored paint sets.